Jack Reacher finds himself in the wrong place at the wrong time as he gets swept up in the kidnapping of Holly Johnson, FBI agent and daughter of the Chairman of the Joint Chiefs of Staff. A radical faction hell-bent on seceding from the US and creating their own country is using Holly as ransom, and it becomes Reacher's responsibility to not only escape, but to stop the inevitable. 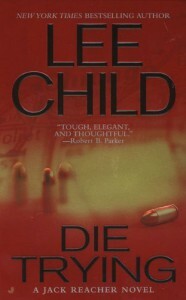 Lee Child writes a fast-paced, well-penned story with a lot of impressive technical detail and well-developed characters. This one was a joy to read.